The Life of Bon: On babies. Round 2. Yes, you read right. This is round 2. Round 1 was in January when I made a deal with God to let me wait a little while longer to have babies. You know, to let me be selfish and self serving and a bunch of other self- stuff that doesn't include babies. Actually, if I think about it, that was round 2. The real Round 1 occurred clear back in October when Hubs brought home a stuffed teddy bear to cure my one and only fit of baby hunger. So I guess if we're being all technical about it, this is really Round 3 of baby thought. But come on, who's even keeping track around here? I blame round 3 on Dennis. You see, a couple of weeks ago we met up for lunch. Dennis and his wife recently welcomed their first little bundle of joy. (I gave the babe some life advice here.) Mountain bikes and nights out were exchanged for pacifiers and burp cloths. Movie theatres and manicures morphed into monitors and medicines. "So how is it?" I demanded to know. "What's it like being a father?" "It's amazing..." he started, "But... it's also really hard." "Just make sure you're ready for it." And, just like that, we were done, on to another topic. But the line stuck with me. Make sure you're ready for it. So I thought about it a little and I thought about it a lot and I got to wondering. How exactly do you get ready for cooing and cuddles and soft, bubbly kisses? 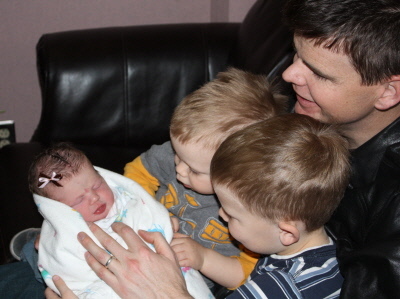 My oldest brother and his two sons welcoming their little sis to the family. 2010. And more importantly, how do you get ready for sleepless nights, lost independence, and a lifetime of caring for someone else? Are you ever really ready? And when you are, how can you possibly know? I ain't no young buck to be having babies- especially in Mormonville. I'm pushing 26 and my friends from every stage of life- high school, college, even my mission buddies- are multiplying and replenishing and fructifying and I'm just here waiting to be ready. I guess I've always been hesitant to take big, life changing steps. Especially when there's no exit door. And let's face it, having a baby is the defintion of a big life changing step with no exit in sight. The only reason I was able to commit to a marriage was because of days and weeks and months spent with Hubs, a shared love, and an assurance that I couldn't live without him. Plus, it didn't hurt that I had dated countless losers before I landed on Hubs. When I met him he blew the competition away, and I knew I had found "the one." But how can I be certain that I don't need countless babies before I find the one that suits me best? How do I know that the first 20 babies won't dissatisy me in some way and leave me feeling that there is certainly a better baby out there if I just keep looking? I don't understand our society- they preach down your throat, "make sure you marry the right person, you gotta know him good, make sure you have exhausted all possibilities and found the absolute perfect one and only right person for you." And then, they go and expect you to invite a baby, a perfect stranger, to live with you and always be a part of your life without ever once having been introduced! Some nerve, our society, I tell you! The more I think about it, the more I am shocked that anyone chooses to have babies. Do people even realize what they are giving up when they do so? A baby means no more freedom. No more selfishness. No more long hot bubble baths when I get home from school. And I like long hot bubble baths. My best friend, Akasha, is two years younger than I am. We were friends throughout high school, roomed together in college, and even spent four months bathing in the Hawaiian sun before I booked it for Argentina. Single and carefree. Hawaii 2007. She's expecting baby #3 in July. And I wonder, were you ready, Akasha? Were you ready for naptime and playtime and interrupted dinners and hellish plane rides and car seats and babysitters and colic and jaundice and oh my goodness I'm overwhelmed. I guess I just had to get it off my chest. Because you know that boy I live with, Hubs? He's ready. Ready whenever I am. He's always ready, though. He was ready to marry me months before I knew his name, so obviously he's going to be ready for a baby. But how does a girl (I guess at this point in my life I should be referring to myself as a woman?) know that she's ready? Ready to take a leap of faith and ready to welcome a person she's never met into her life and ready to give up her entire life for a complete stranger?! I mean, I know someone did it for me (thanks mama! ), but what if I am not selfless enough to do that for someone else? I admire women who can pop out babies right and left. I really do. My mother was one of them. I admire their ability to nurture, to give, to sacrifice. I admire that Akasha can be so completely happy with her little family and not resent those toddlers for anything. I admire women that just want to hold their babies and love them and are so happy and content to stay at home and raise their children. But can all women do that? Great post, and great thoughts! The only thing I can say is that the same way you knew in your gut that your husband was "the one," is the way you will know when you are ready to be a mommy. You will feel it in your core. I just had my first in December and yes...you are right, you give up a lot for those little stinkers,it's hard as all get out, but I can honestly say it is worth it. You'll be a great mom when the time comes! I hear ya girl! I'm only 23 and going on 2 years of marriage and while I'm in no rush to get into baby makin, I seriously wonder If I'm cut out for it. I mean let's get real, being selfish and having endless time to yourself is a pretty sweet deal! I mean, I'm no where close to being married OR having babies... but when it comes to thing like this, the one thing that always pops into my head is, "leap of faith". so. yeah. It is definitely a big change and you have to give up a LOT. I finally got to the point where I felt like I was as happy as I could be with just the two of us and there was a void that couldn't be filled by love and marriage. Then I waited until it logically worked out in our life situation...aka until i was done with school. You have to be ready because otherwise you end up resenting them. Don't feel pressured or rushed. You still have like 14 childbearing years in you...so give it a few and see how you feel :) In the meantime come babysit Allie. Bonnie.. First off you will be an amazing mother! I don't personally know you, but I feel like I do through your posts, and I do personally know your husband and he is a great guy and so I know that you have to be nothing short of amazing! Second thing.. please ignore any and all grammatical errors.. because I am sure there will be way to many. And now for my spill on motherhood... You will know when you are ready. Just like you knew when Greg was the one for you! You will also never feel like your baby is a stranger, from the second you find out that you are pregnant you will love that little fetus more than you ever thought possible! And when your baby is born, your marriage will change, but it will still be full of love and new adventures and challenges! As your baby learns and grows you will be amazed at how much love your heart can hold and how wonderful being a mother makes your life.. It is definately a descion that should be made between you, your husband and the lord. My advice is to completly leave it in the lords hands. After my husband and I were sealed in the temple on our first anniversary,(May 2010) we decided we weren't going to use any sort of pervention and we were going to leave it completly up to the lord, we got pregnant a few months later and then found out that we lost the baby.. we were then advised by my doctor to let my body recover for a few months and then we tried again.. and we immediatly got pregnant again and we were blessed with a beautiful baby girl last August(2011).. but that was a whole year and a half later after we decided to leave it in the lords hands. Good luck and I know that you will be an amazing mother! Oh Blackie, I miss you and your craziness. I just thought I would share how this whole "being ready" thing worked out for me. Basically Darin and I were baby watching (a similar practice to people watching) in sacrament meeting, when BAM the spirit tells me I need to have one of those. Then Darin leans over and says "we need to have one of those". And I was not ready. Not at all. It was sooner than we planned and I tried to tell Heavenly Father about that for a month while I continued birth control and pretended that I knew better than He did. Basically, I don't think anyone is ever truly ready because you really don't know what you are getting yourself into when you get pregnant. Pregnancy, labor, parenthood: it is all really, really hard. But it is also the most incredible thing you will ever do. When Lily was new, there were nights when hearing her cry literally made me want to stab my eyeballs out, and I would get up to nurse her and just sob. But aren't there a lot of really hard things in life that make us feel that way? We do them anyway because they are important and because they are right and because when you get over the cry fest, (in the case of having a baby anyway) you LOVE that little stranger more than you ever knew you were capable of (and actually, they don't feel like a stranger when they are placed in your arms for the first time. You know them, they know you. It is amazing). Then you realize that you can fit naps in, and that you will always have the Lord's support because you are never handed a task that is too great for you. You are enabled accordingly. Oh and part of the reason you can feel "ready" is because the person you spent months getting to know and falling in love with and trusting completely will be there too, doing it all with you. Ok, I'm not even married yet, but I already often think about all the things you mentioned in this post. About a year back I went through a phase where I become baby obsessed (blame the blogopshere) and I wanted to try and have a child as soon as I got married. After I really started thinking what it means to have a child though, I've recently backed off and decided that there are still a ton of things I want to cross of my life list before I welcome a little one into the world. I am 30 years old and have been married for almost a year and people are already asking when we're going to start popping them out. Our answer is, honestly, not for awhile. We enjoy our freedom, we enjoy traveling, we enjoy going out whenever we can and not having to rely on grandparents and babysitters. Sure that's probably selfish but that's the way we feel right now. We know we want at least one but yes its a BIG change, one that I don't think either one of us is ready for. We have 6 nieces we can live through as well. I also want a house before we can raise a kid and I want my dream job back. So I have a lot of goals before a baby can come into our lives. I don't think one is ever truly ready either. There's always going to be something you didn't realize or whatnot when a baby comes that is going to snap you into a reality of some sort. But in the end you'll know. You will never be "ready." But when you have one, all the sacrifices in the world are worth it. Being a momma is hard work, its exhausting, it's maddening sometimes. But, when you hold that new baby, when you see those first steps, when you wonder if you are messing them up, when your teenager tells you her secrets, you will know you made the right decision. Sometimes you just gotta trust God and go for it. I have no idea, but I'm glad you asked so I can read the comments that other, more wise people, write. Somedays I am and somedays I'm not. I've never known you can want with such desperation and fear with such terror the same thing. Bonnie, I loved this post. I have felt the same way at times. Something that helps comfort me is praying and really asking my Heavenly Father to help be selfless and really trust in him! He knows when the time is right. That is something I am trying to deal with, the whole he knows the right time thing. I get super baby hungry all the time. I guess I have a little different perspective because I didn't feel like "it's time" or "I'm ready" at all! I never had that gut feeling. We got pregnant on accident and I was not ready in the least but what is so cool is you have nine months to prepare physically and mentally and all the while you feel that little thing growing and moving inside of you and you already feel a connection. And when they come it's an instant love. How could you not love a part of you and a part of the person you love most in the world? It's pretty cool really. And yes I had no idea what I was getting into with the up all night newborn and the always planning around the babies schedule. But what you give up in freedom you get back in absolute joy in seeing your baby learn and grow. It really is fun (just in a different way). ps I was one of the most selfish people I knew before I had a baby and I still kind of am. When my girl was about a week old, I looked at her and said to my mom, "I really think this was a mistake." And I meant it!! But over a few weeks we slowly got into a pattern and it was the most calming, relaxing thing I've ever done. I looked forward to feeding her when I would have to sit for half an hour watching Friends on tv while I nursed her and then gave her a bottle. When can you watch Friends AND feel productive? Its a once in a life time thing. Right now, when I do get to stay home with Olivia, she takes two naps (1-1 1/2 hours EACH) and sleeps 12 hours at night, giving me free time from 7pm-10pm when I go to bed. So I have plenty of time to still be me. . . I didn't want to have a baby, but I knew if I didn't I would regret it in ten years, so I just jumped in and adjusted! First of all, I love this post. Such an excellent way of putting things. I've been "ready" for about a year and a half. My husband and I found out we have some reproductive challenges and then came the whole cancer thing. So obviously we aren't physically ready, even though we are mentally ready. At this point though, I would GLADLY give up spontaneous trips, movie nights, naps, freedom to be a momma. When you are REALLY ready (like beyond normal ready), those same feelings you had about your husband before you married him, you will have them for your future baby. great post and truth is you'll know when and if you are ready to have a child when the time comes. There really is no concrete answer. You aren't ever probably going to feel completely ready. And yes it is hard, very hard, but SO worth it. I wouldn't trade it for anything and I truly mean that. My husband and I took the leap of faith and I'm so glad we did. Being a mother is the best thing ever! Thank you for writing this post. I was just thinking about writing a marriage and baby post. You see, I'm from the South and once you marry "they" expect you to procreate. While I love baby snuggles too, I have the same questions about being ready. I'm 27 and have been married for 6 years. The time is coming, but I think we'll have a more secure feeling of readiness when we're ready. I sure do hope so! I understand where you're coming from. I'm not even married yet, and I would love to be married at least a couple of years before thinking about kids. However, I'm also pushing 26. Women my age around here have 1, 2, or even 3 kids by now. At this point though, the boyfriend and I only want 1, so I can see us waiting until I'm in my 30's. I can't even imagine giving up from freedom. When you have a child, you can't give them back. You can't say "hey can I return this for another one?" That child is yours for life. That's a huge responsibility! One that I don't think I'll be ready for for quite awhile. You're definitely not alone on this one! Just remember to have children when it's right for you and your husband, not anyone else. This is my first time visiting your blog, my friend Brittani linked it from her blog, so hello. I really wanted to share my feelings about motherhood with you. Like everyone has already said, you will never feel fully prepared or ready, because there are so many unknowns and everyone's experiences vary greatly. But you do need to have the desire for a baby. When I was ready, I was urgently ready! My hubby reached that point before I did as well and once he put the thought in my head I started considering it and got really excited- scared too but excited. I don't feel like I gave anything up for my children, if anything I gained immeasurable amounts of love and life experience and a greater understanding of our purpose here on the earth. (not to say that there aren't hard times, because there are but the good out weigh them by FAR) But I was so grateful and happy to have a baby, that I treasured every minute that I spent with that baby(ies). Sometimes I would sit and look at my baby girl so overcome with love and emotion that I didn't know what to do with myself. It truly is a kind of love that I had NEVER felt before and didn't even know existed. I was on a baby high, some of the things I said to my family members in those first few months of motherhood probably made them question my sanity ha ha. I also wanted to add that I am a "selfish" person as well. But it is so possible to still be you and do the things you enjoy while being a parent. That is what babysitters and hubbys are great for. I still go out with the girls, go to the gym, go on date nights with the hubs, go to concerts and do what I want, not excessively but enough to feel balanced. Because those things are part of who I am and I have always said that I will continue to be who I am and incorporate my children into that. It has worked out great for me, mostly because my husband is very involved and we have the same mind-set. Sorry this was so long but for some reason I really wanted to share with you and I hope I haven't been annoying in my thoughts. Bottom line, you will know your baby by the time it is placed in your arms and when you are ready it will be one of the most amazing experiences of your life! !